Buckeye and horse chestnut trees belong to the soapberry family, named Sapindaceae, genus Aesculus. They are not at all related to true chestnut trees, which are part of the beech family, despite the horse chestnut name and some physical similarities. Buckeyes and horse chestnuts bear poisonous nuts that must not be eaten. Buckeyes and horse chestnuts belong to the same tree family and are unrelated to true chestnuts. They bear similarities in fruit, but horse chestnuts carry larger seeds. The nuts of both buckeyes and horse chestnuts appear shiny and attractive, yet both are highly poisonous and must never be eaten. Most buckeye species reside within the eastern United States, with one western representation, the California buckeye. Their rounded tops, canopy spreads that match their height up to 50 feet and early spring flowering make them appealing for landscaping and shade. Buckeye leaves are palmate and compound, possessing fine-toothed edging and five leaflets. Leaf scorching often occurs. 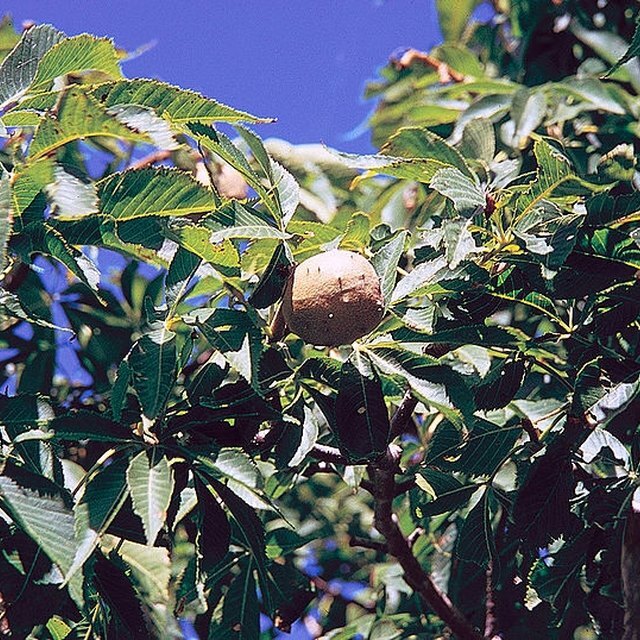 The light wood of the buckeye tree once provided material for cradles and artificial limbs, and still can be used for paper and other small wood items. The fruit of buckeyes bear many spines on their husks, and each husk houses the seed. Buckeyes get their name from their nutlike seeds, which are deep brown with a light spot, recalling a buck deer’s eye. These seeds appear almost lacquered and are highly attractive to collect, historically as good luck charms. Some animals do eat the seeds. They are, however, highly toxic to humans, causing kidney failure. In pioneer days, the kernels of buckeye seeds were used to make soap. Horse chestnut trees belong to the same tree family as buckeyes. However, horse chestnuts originated in Europe, specifically the Balkan region. Horse chestnut trees may also be found in the United Kingdom. Horse chestnuts grow 50 to 75 feet in height, with an oval crown and a canopy spread of 40 to 70 feet when mature. Horse chestnut leaves are large and obovate (teardrop-shaped with the point at the stem end), with coarse teeth and seven leaflets. Highly prized as ornamental trees, horse chestnuts produce magnificent, upright clusters of white flowers with yellow and red touches that can grow to almost a foot high. The horse chestnut has sticky buds that distinguish it from buckeyes and other trees. Its fruits appear less spiny than buckeye fruits. The husks contain one or two seeds. These are the storied conkers, beloved by children in games. These “nuts” are larger than buckeyes and less shiny. They do provide food for deer and other small mammals. Extracts made from the leaves and fruits of the horse chestnut are used as herbal remedies, after the extraction of a poisonous compound called esculin. The extract has been used for chronic venous insufficiency; however, humans must not eat horse chestnuts, as they are poisonous. Dianne, J.. "Difference Between a Buckeye Nut & a Horse Chestnut." Sciencing, https://sciencing.com/difference-buckeye-nut-horse-chestnut-5523161.html. 23 April 2018.